Pins x We Love Filly (by O’Reilly) which is a proven cross already producing 94 runners, 66 winners including 8 Stakes winners. BEST CASE (Savabeel). 3rd South Australian Derby, Gr.1, ATC Tullock S., Gr.2, 4th ATC Shannon S., Gr.2, Stan Fox S., Gr.2, MRC Sandown Guineas, Gr.2. 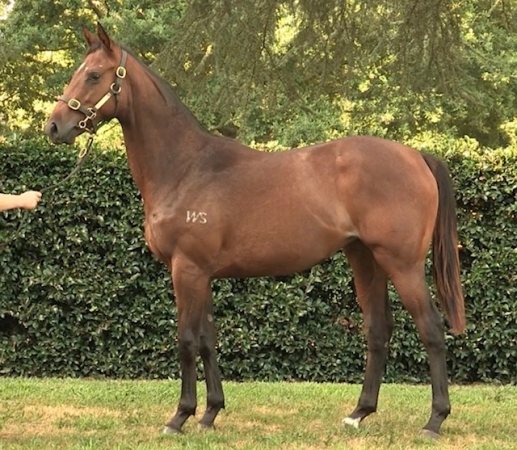 She was purchased as a weanling from Waikato Stud and then had all her development done at Mapperley Stud where she has grown into a well built stunning Filly. All the hard work has been done for the well bred Filly who has it all in front of her. She is located in New Zealand. MUST BE SOLD, MAKE US AN OFFER??? PINS (AUS) (Bay 1996-Stud 2000). 7 wins-1 at 2, VRC Australian Guineas, Gr.1. Leading NZ Sire (worldwide earnings) twice. Sire of 1053 rnrs, 721 wnrs, 76 SW, inc. El Segundo (MVRC WS Cox P., Gr.1), Ambitious Dragon, Legs, Aerovelocity, Katie Lee, Porotene Gem, Econsul, A Touch of Ruby, Antonio Lombardo, Mackintosh, Legless Veuve, Shopaholic, Icepin - Regency King (H.K. ), Rolling Pin, Gallopin, Lauren Tate, Pimms Time, Megapins, Pinsoir, etc. WE LOVE, by O'Reilly. Unraced. Three-quarter-sister to Patrick, half-sister to DELTA GIRL. This is her second foal. Her first foal is a 2YO. Devil's Nite. 4 wins to 1200m, MRC Zonda H.
Felarof. Winner at 1650m, HKJC Uranus H., 2d HKJC Kokura H., 3d HKJC Willow H.
STRIKE THE STARS (Savabeel). 3 wins from 1400m to 3200m, A$612,300, to 2017-18, ATC Gloaming S., Gr.3, City Tattersalls Club H., 2d VRC Australian Guineas, Gr.1, 3d NSW Tatt's RC Chelmsford S., Gr.2, VRC Tab.com.au S., Gr.3, ATC Lord Mayor's Cup, L, 4th Australian Derby, Gr.1, South Australian Derby, Gr.1. Best Case (Savabeel). 5 wins from 1200m to 1800m, A$432,080, to 2016-17, BRC Wilpak Wholesale Meats H., ATC City Tattersalls Club Inglis Bonus, Vincents Chartered Accountants H., 3d South Australian Derby, Gr.1, ATC Tulloch S., Gr.2. Golden Sand Steed (Pins). 8 wins at 1000m, 1100m, S$533,612, Singapore TC Japan Racing Association Trophy, Class 2 H., 2d Singapore TC Kranji A S., 3d Singapore TC Kranji Sprint, L, Open H.-twice. Patrick (O'Reilly). 4 wins at 1200m, 1600m, WRC Shephard Dunphy H., Hawkes Bay Let's Go to Turk's Bar H., Russell Roads H., 2d Timaru Cup, L, Manawatu RC Noel Eales Memorial H., 3d WRC Douro Cup, Hawkes Bay Let's Go to the Cru Bar H.
Another Dollar (Ocean Park). 2 wins at 1300m, 1400m, A$256,650, in 2017-18, Toowoomba TC AG Rigging H., 2d BRC Queensland Oaks, Gr.1, The Roses, Gr.2, Gold Coast Bracelet, L, 3d BRC Mt Franklin H.
Placement (Savabeel). 5 wins from 1300m to 2100m, A$472,378, MRC Monjon Security H., 2d VRC Wakeful S., Gr.2, MRC Ethereal S., L, SAJC Centaurea S., L, 3d VRC Oaks, Gr.1. Producer. MARSEILLE ROULETTE (Zizou). 4 wins-1 at 2-at 1000m, 1200m, A$229,630, S$72,798, to 2017-18, ATC Inglis 2YO Classic, RL, Singapore TC Always Fast S., Class 4 H., 2d ATC Sky Racing H., 3d ATC Run to the Rose H., Gr.3.